I love the fall season and it’s finally feeling like fall in California; to celebrate finishing midterms and this glorious weather, Here are my 6 Fall Favorites! We all know if I’m doing a favorite post, I’m going to be talking about Lush Cosmetics. Lush is awesome but what makes them really awesome is their fall and winter collection! My favorite fall Lush product is the Sparkly Pumpkin! The sparkly pumpkin has a cinnamon and citrus scent and it makes your skin feel super soft. Did I also mention this bath bomb is glittery?! Sparkly Pumpkin is a seasonal product so get it while you can! I’m not one that wears lipstick, but when I do it’s during the fall. I love wearing a dark berry color; I think it can help tie in an edgy look. My favorite lipstick is Kat Von D’s Motorhead. It’s so dark that it almost looks black; you gotta try it out. Eyeliner is my weakness; perfect winged eyeliner can kill me. I know the Benefit Push-up Liner has been out for awhile but it’s an amazing product; if I was to rate this eyeliner, I would give it 5 stars. This eyeliner is easy to apply on, it’s waterproof and makes the perfect lines. I also love how long-lasting this eyeliner is! I know it’s a bit pricy but it is totally worth it every cent. For my MAC readers, this is something you might like. I needed a concealer brush to help cover those pesky unwanted red spots. One of the MAC girls recommended the MAC 159 brush; it looks like a small rounder version of the 187 brush but with more fibers. This brush is gentle on the skin and it helps blend my concealer. My advice, get it. My go to drink during this season is a nice cup of hot tea. As much as I love going to tea houses, it can add up and become unwanted expenses. To fix my tea cravings, I get a box of Yogi’s Detox Tea; it’s earthy and spicy but has a sweet aftertaste. Yogi’s teabags also has sweet little messages on every tag. With reading all of my textbooks for school (yes I read my textbooks please don’t judge), it’s hard to read for fun. 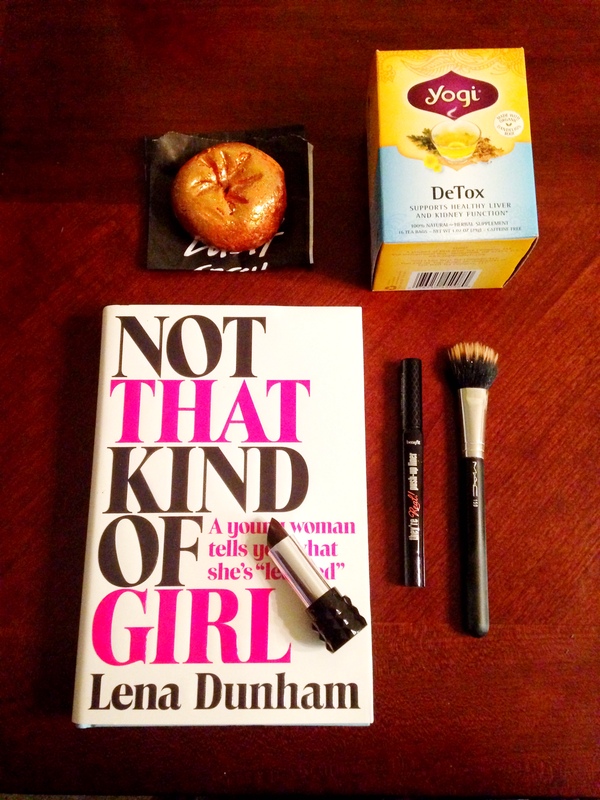 I just started reading Lena Dunham’s Not That Kind of Girl and I have to say, I’m impressed. I’ve never had the desire to watch her hit show, Girls, but this book might change my mind. From what I got from the book so far, Lena is the lovable odd outsider that I can relate to… Maybe when I’m done reading it, I’ll do a review on the book for a future blog post. I hope you liked this post; if you did make sure to comment below! If you want to see more of my favorites for future posts please let me know… I’ll add more pictures next time. I hope everyone is doing well and make sure to keep yourself healthy during this season! Thank you, Oscar de la Renta.